For me, Glu advances the power of, and what's possible from, social media. Now we have the opportunity to directly give, in large numbers, in warp speed, what those who are doing the research, creating better treatments and designing new tools, need to improve our lives. MyGlu.org (Glu), an online community for people living with and touched by Type 1 diabetes, launches Nov. 1, coinciding with the kickoff of National Diabetes Month. Glu also launches an innovation in the use of social media. Now a social media site is not just a place to come together and share our stories and support, but a means to help accelerate better treatments, therapies and research for a disease. Glu is the social community arm of the T1D (Type 1 diabetes) Exchange. The T1D Exchange is a non-profit organization dedicated to improving life for those living with Type 1 diabetes. It aims to accelerate better treatments, therapies and research for Type 1 diabetes through a vital network of consumers, clinicians, researchers, pharmaceutical, device, education and outreach organizations all working together. 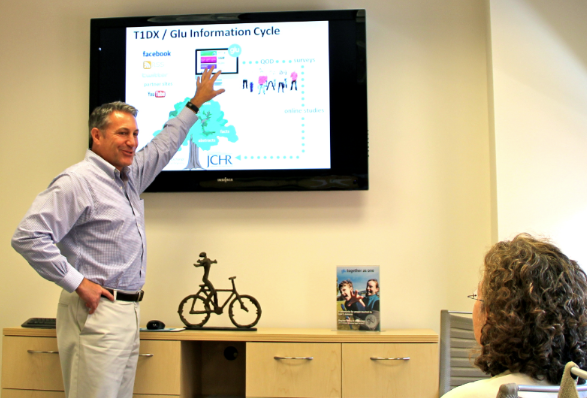 The T1D Exchange, including Glu, was created through the generous funding of The Leona M. and Harry B. Helmsley Charitable Trust. Both the T1D Exchange and Glu are under CEO Dana Ball, a long-time patient advocate and non-profit champion, who helped advance education, treatment and cure advocacy work in HIV/AIDs. I met with Ball in August, and as he unveiled to me Glu and the T1D Exchange, I felt perhaps for the first time since I got Type 1 diabetes 40 years ago that something is really going to happen to make my life significantly better. Simply, Ball has put together a social and business innovation in information sourcing and sharing in Type 1 diabetes. He has linked the arms and sped the transfer of data and research among diabetes-related organizations. Plus, this is all the more remarkable in a field that's highly fragmented. In addition to its network partners, the T1D Exchange also partners with nearly 70 clinics across the country for its Clinic Registry and Biorepository. As such, the Exchange elicits information from more than 26,000 people living with Type 1 diabetes that is critical to its partners' research and development. Gathering information from so many thousands of respondents to seed targeted needs, this unique collaboration promises to collapse cycle time toward better treatments, therapies and research toward a cure. Through Glu, people living with Type 1 diabetes and loved ones have an online site targeted to their specific needs, and those who chose can participate in Glu's daily questions, discussions, and periodic surveys, adding to the T1D Exchange's data collection. Glu members will also be provided with the learning gathered from site participation, as well as data collected from the Exchange's Clinic Registry and Biorepository partners. Ball says, "It's all about the patient. The T1D Exchange, Glu, what we're doing all starts, is centered around, and ends with the patient." Another innovation. Joyce Lee, pediatric endocrinologist and director of research for Glu, says each month the community will highlight information and education around a specific theme of interest, and she hopes "not only will Glu be a social fabric of support for patients, but also help unite patients and health care professionals ... I know for myself," Lee said, "better understanding the community members will make me a better clinician." For me, Glu advances the power of, and what's possible from, social media. Now we have the opportunity to directly give, in large numbers, in warp speed, what those who are doing the research, creating better treatments and designing new tools, need to improve our lives. While Ball admits the cure is still a distant goal, the T1D Exchange creates the means to bring us closer, faster. I left my meeting with Ball invigorated and hopeful by both how grand his vision is, and how small. As small as caring enough to create a brand identity, T1D (Type 1 diabetes), for all of us who live with this all but invisible, potentially-devastating disease. Riva's new book, Diabetes Dos & How-Tos, will be available in November, along with 50 Diabetes Myths That Can Ruin Your Life and the 50 Diabetes Truths That Can Save It and The ABCs Of Loving Yourself With Diabetes. Riva speaks to patients and health care providers about flourishing with diabetes. Visit her website DiabetesStories.com.